As you can tell, I checked-out The Miniaturist from the library. I will definitely purchase this book for our home library. I love it! Happy Literary Friday, My Lovelies! 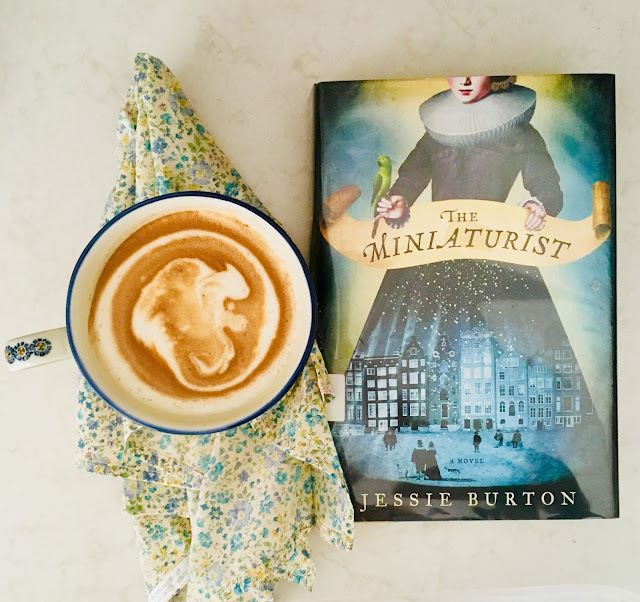 Recently I read The Miniaturist by Jessie Burton because I wanted to read the novel before watching the series on Masterpiece Theater. I have yet to see the three-part series because we've been busy, and when we're watching TV we're watching the final games of the Cubbies' 2018 season (and hoping they will win the National League Central Division). Set in seventeenth century Amsterdam--a city ruled by glittering wealth and oppressive religion--a masterful debut steeped in atmosphere and shimmering with mystery, in the tradition of Emma Donoghue, Sarah Waters, and Sarah Dunant. On a brisk autumn day in 1686, eighteen-year-old Nella Oortman arrives in Amsterdam to begin a new life as the wife of illustrious merchant trader Johannes Brandt. But her new home, while splendorous, is not welcoming. Johannes is kind yet distant, always locked in his study or at his warehouse office--leaving Nella alone with his sister, the sharp-tongued and forbidding Marin. But Nella's world changes when Johannes presents her with an extraordinary wedding gift: a cabinet-sized replica of their home. To furnish her gift, Nella engages the services of a miniaturist--an elusive and enigmatic artist whose tiny creations mirror their real-life counterparts in eerie and unexpected ways . . .
Johannes' gift helps Nella to pierce the closed world of the Brandt household. But as she uncovers its unusual secrets, she begins to understand--and fear--the escalating dangers that await them all. In this repressively pious society where gold is worshipped second only to God, to be different is a threat to the moral fabric of society, and not even a man as rich as Johannes is safe. Only one person seems to see the fate that awaits them. Is the miniaturist the key to their salvation . . . or the architect of their destruction? I love this book because of the setting and the characters. The setting couldn't be better for someone who loves historical fiction: The Dutch Golden Age. The Dutch Golden Age was a period in the history of the Netherlands, roughly spanning the 17th century, in which Dutch trade, science, military, and art were among the most acclaimed in the world. Nothing showcased wealth more than a dollhouse: these Dutch miniature homes were no toys, however. The cost to build and furnish these tiny replicas was equal to that of a real home. I also enjoyed the characters in the book, especially Nella. Her circumstances remind me of Rebecca (one of my favorite novels), and at first I didn't think she'd be able to cope due to her age and inexperience. However, she quickly proves to be a thoughtful and strong woman. It's true that the Brandt household is full of secrets, secrets so scandalous they could be life-threatening. But the scariest part is that the miniaturist seems to know all their secrets, and she provides Nella clues to them via furnishings for the dollhouse. Nella doesn't feel as threatened by the miniaturist's intimate knowledge of the household, rather she becomes more emboldened because she believes the miniaturist to be benevolent towards her, almost encouraging. Nella searches for the miniaturist's workshop because she wants to ask her questions about: the items sent (many of them were not commissioned by Nella); her encouraging yet cryptic notes included with the parcels; and how she knows so much about the household. If you enjoy historical novels about family drama, then you will love this one as it's set in one of the most opulent and contradictory (calvinistic versus wealthy) times in history. The Miniaturist has been a book club favorite, and I can understand why. It's so well-written, and I could not put the book down. I read it in one day! 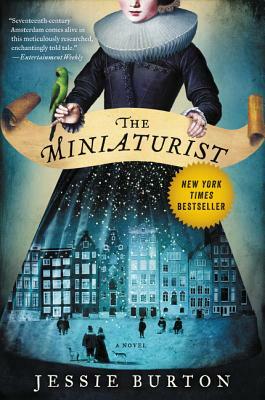 One of the criticisms I've read about the book is the lack of closure with the miniaturist character (also named Petronella), but I disagree because her being an enigma adds much more to the mood and atmosphere of the story. Below is a video about a real Dutch miniature dollhouse from the Dutch Golden Era. Courtney Harris of the Museum of Fine Arts in Boston does an amazing job explaining the purpose of these homes and how they were furnished. The workmanship is unbelievable, and I hope you take the time to watch it. Below is a trailer for The Miniaturist on Masterpiece Theater. Below is an affiliate link for purchasing The Miniaturist via IndieBound. I hope y'all enjoy the first full weekend of autumn! Please share what you've been reading! I have The Miniaturist taped and can't wait to watch it! Have a great weekend, Ricki Jill. I can’t wait to see this series too. Do you know the air date on APT? I have to read this book, it sounds so perfect and interesting for me. RJ, I saw one of those dollhouses at the Rijks Museum in Amsterdam a few year ago. I was amazied at the detail of the miniatures. Thank you for the informative video. i had no idea! i too will be looking for it on APT. Oh, I'm glad you featured this. I haven't had a chance to watch and am hoping to catch it online. (I did see part one but haven't seen the rest). It felt creepy to me and I was having trouble deciding whether I wanted to stick with it, although it's beautiful production values. Thanks -- I think I'll catch up with the series and maybe even the book! Thank you for including the video, fascinating! You've got me hooked! Go Cubbies! Oh I have been waiting for this review from you. Thank You! Please so another on the TV series. I cannot wait to read this and then to watch the show. I have had the book for awhile but now I will move it to the top of my stack!